Here on TechClient, everyday we present free best (HQ) resources for your web design & graphic design projects. 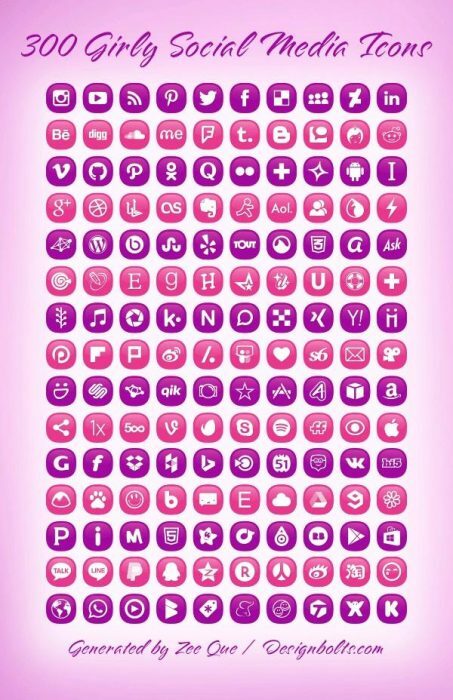 Today we are going to share 300 Pink & Purple Girly Free Social Media Icons. In this post we present 300 Pink & Purple Girly Free Social Media Icons that presented by ZQ. I designed something for girls’ blogs. Pink and purple are the colors reckoned to be of girls. They keep having these colors in their wardrobes and whatever they get. So we can name pink and purple as girly colors. All the girly blogs having adorable themes will for sure be great companion with these icons. Most of the things you say is ssrppiuingly accurate and that makes me wonder the reason why I hadn’t looked at this in this light before. Your piece really did switch the light on for me as far as this particular subject goes. Nonetheless there is actually one particular issue I am not really too comfy with and whilst I make an effort to reconcile that with the central theme of your issue, allow me see just what all the rest of the readers have to point out.Nicely done.